The general idea for my geo-visualization project was to utilize GIS files to create a Minecraft world. What is Minecraft you may be asking? Minecraft is a computer game, similar to Lego, where you can create environments with 1×1 blocks. This makes it an ideal candidate for working with GIS data as it provides a reference scale to build upon. To facilitate the transformation of GIS data to Minecraft, FME by Safe Software was used. FME is an ETL software that can read and write to numerous file types. It also has countless transformers that can alter the imported data. For the sake of this project, LiDAR data and vector shapefiles were used to populate the new world. 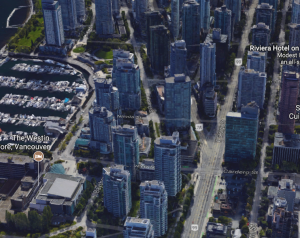 To create the base for the Vancouver Minecraft, we had to create a digital elevation model (DEM). A LiDAR data set was used to create the DEM within FME. This step was important because it forms the ground that everything would be placed upon. In hindsight, a traditional raster DEM may have been better, since the LiDAR had classified things like cars as ground. The following is a picture of the LiDar file used to create the DEM and buildings in the Vancouver Minecraft. All areas below sea level were separated to be attributed water blocks. 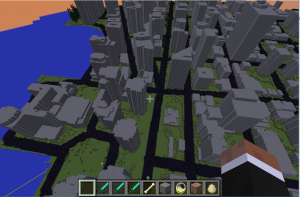 Below is a screenshot of the LiDAR used to make the Vancouver Minecraft. The buildings in the Minecraft world were created using the LiDAR data and building footprint shape files. The shapefiles were needed to ensure the Buildings were created at the right elevation. The z values from the lidar data were used to define the extent of the buildings and the footprints were used to clip the data so there was no overlap. This data was all put into the 3D Forcer and Extruder tools in FME. This produced 3D models of all buildings in the study area. Below is an image of some of the buildings in the minecraft world and the same area in real life. To add some more features to the Minecraft world, two shapefile vectors were added. One was a road vector, and the other was a street tree shapefile. FME was able to clip this data to the extents of the DEM. Below is an image of each feature in the game. The vector layers were given the condition to be placed 1 unit above the elevation of the DEM at the X-Y coordinate. This would ensure that the vector layers were on top of the ground. No other online case that I could find used both LiDAR and vector shapefiles, so this was a successful trial of the technique. 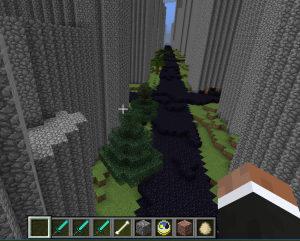 Below is a picture of the roads in the minecraft world and a picture of the street trees on Georgia street. The trees were planted as saplings in the game, so it took 30-45 minutes for most of the trees to grow. The bumps in the road are either to do with a rise in elevation, or cars that got coded as ground features in the LiDAR data. Once the ground, water, buildings, roads and tree files were all selected, they were all transformed into point cloud data in FME. The point cloud calculator was also used to append each data type with a Minecraft block ID. This will allow Minecraft to build the world with the proper coloured blocks. These individual point clouds were then combined with the PointCloudCombiner tool. Some were also given elevation parameters to ensure they rested above the ground. Finally, the world was scaled down 50% to ensure it all fit within the Minecraft box. Then the point cloud was exported with the Minecraft writer, with each point being assigned a Minecraft result. Here are some more pictures of the world and the FME work-space used to construct it.